When David Cho, the wunderkind publisher who helped turn The Awl into a well trafficked website, left the small start-up to join Bill Simmons' Grantland, media watchers hailed it as a nice little coup for the ESPN-backed launch. "The opportunity at Grantland and to work with Bill and to work with some of the people at ESPN is the only job that ever could have made me even consider leaving," Cho wrote in an email to friends announcing his departure. This week, a group of sportswriters announced plans for a daily Web publication--modeled after The Awl--that sounds like it may tread, at least in part, on Grantland's turf. 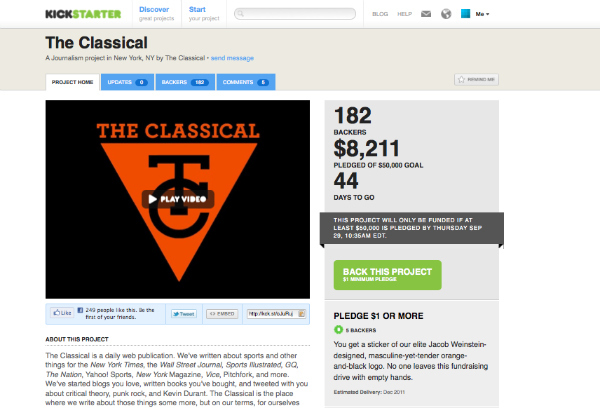 The Classical, as the site's founders are calling it, is in its initial phase of fundraising. The founders submitted it as a Kickstarter project in the hopes of raising $50,000 for the launch. According to its Kickstarter description, the site "will deliver several regular columns, a host of quick, random goodness, and a fun, smart community for talking about the sports world." There will be long features (a 25,000-word piece on Pete Alexander, say, or introductions to particular niches of sports fandom) and contributions from the world: prizewinning novelists, internet celebrities, guys and girls we went to school with who are unappreciated geniuses, members of the public. We will make no attempt to be comprehensive, or even to offer a reliable guide to the world of sport at a given moment. We will not try to be a smarter version of what you can find elsewhere. Instead, The Classical will be a running, wide-ranging conversation between us and our readers about baseball, basketball, soccer, football and fighting, and about things that aren't sports, too. "We've started blogs you love, written books you've bought, and tweeted with you about critical theory, punk rock, and Kevin Durant," the description reads. "The Classical is the place where we write about those things some more, but on our terms, for ourselves and for the audience we know is out there." "It's probably a lot more like the Awl than Grantland," Shoals, who founded FreeDarko.com, said. "The Awl has a strong commenter community, is really elastic when it comes to format, and constantly comes up with stories you never saw coming. It was independent from the beginning and has stayed that way. The Awl has also provided an outlet for a lot of writers, and ideas, that weren't getting exposure out there." "Writing about sports the way that smart people talk about sports is a simple idea, and a good one," the description adds. "To do it right, though--to set up a sustainable business, rather than yet another blog or Tumblr--takes some money. Site design and hosting, lawyering and other businessish stuff, and keeping a couple of us at this full time while we show and prove ourselves will require resources. We need to fund our budget for one year, and we need your help to do it." "I could say that we just want to realize our vision and that's it," Shoals said. "But really, I would like to see some of us make a living, however modest, from this site. That's a long way off, though. First we have to get all those chip clips sent out."